Google Index Status Report Update Was Not A Bug? Home > Google News > Google SEO > Wait, The Google Index Status Report Update Was Not A Bug? 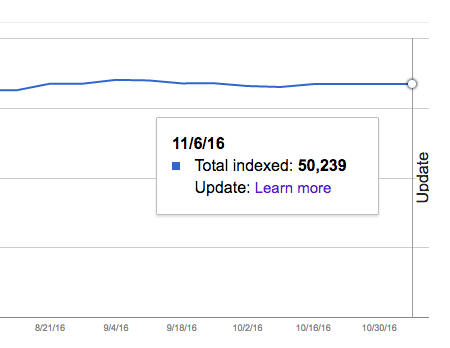 The other day, we reported there was an unknown update to the Index Status report in the Google Search Console. John Mueller then said on Twitter "we fixed the glitch," and the "update" line in the report went away. But now, the data anomalies page does show up an update for November 6th, but the line is still missing from the report. Internal index updates. These changes should have a minimal affect on end users. I guess it was not a bug? But it might be related to the infrastructure updates that are being performed now on the Search Console? Here is a new tweet from John after I wrote about this on what is going on? @glenngabe some sites will see a change & we don't want to scare them if it's on our side.